An Annapolis day sail aboard The Liberté is a perfect way to have fun outdoors this fall, but did you know an early autumn sail can also benefit your health as well? An Annapolis day sail aboard The Liberté is a perfect way to have fun outdoors this fall, but did you know an early autumn sail can also benefit your health as well? While sailing around Annapolis on a breezy October day can be a great opportunity to enjoy a colorful view and take photos, it can be an excellent boost for your health as well. Why not give it a try in the upcoming weeks? Between now and October 21st, there are plenty of opportunities to enjoy a fall day sail aboard The Liberté. Staring at computer and phone screens throughout the week can take a toll on our health. With this, we sometimes need to recharge our minds with a significant amount of quality time spent outside in the sun and fresh air. As you sail around Annapolis aboard The Liberté this October, the sight of the ocean will surround you and serve as a perfect fix for a cluttered mind. Escape from the stress of a long work week with a fall day sail and enjoy the colorful autumn scenery from the waters of Annapolis. The calming sight of the Bay alone can also help to reduce anxiety and lower your stress levels from a busy week. 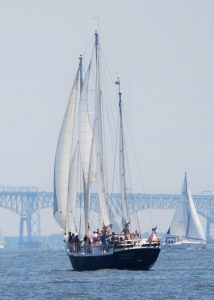 Escape from a lack of creativity or infamous writer’s block with a relaxing day spent on the Chesapeake Bay. As you unwind with a relaxing sail, the sight of the blue water and a memorable adventure can also help to inspire you in your creative project. Whether you are inspired to write about your new experience or your photos inspire you to complete an original painting, a beautiful sail can provide you with plenty of inspiration. Enjoy the beauty of the scenery along the Bay and allow your experience on the water to refresh your creativity. In addition to relaxation and inspiration on the water, an autumn day sail is an excellent way to enjoy a day of special memories with your family and friends. As you sail aboard The Liberté, you can also enjoy a scenic view and an adventure with your family and friends, and even celebrate a special occasion! From a romantic fall wedding to fun family reunions, a sail along the Chesapeake Bay is the perfect way to share a great time. This entry was posted on Thursday, October 4th, 2018 at 10:48 pm. Both comments and pings are currently closed.